For anyone who ever built model airplanes using a spray gun or just an aerosol can, this is all going to seem pretty familiar. To everyone else, this clip is simply one step – although a very visible one – in the process of airline evolution. Enjoy. And so long Northwest Airlines. It was nice knowing you. 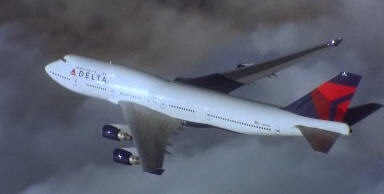 Technorati tags: Delta Airlines, Jetwhine.com, Northwest Airlines, airline, air travel. This entry was posted on Wednesday, January 21st, 2009 at 6:07 pm	and is filed under The Buzz. You can follow any responses to this entry through the RSS 2.0 feed. Both comments and pings are currently closed. Libby worked for the lawyers on the pilot merger of the two airlines, and congrats on your award!! !